I’ve been reading about the case against Purdue Pharma, and the fact that the company knew about the addictive effects of the opioids they produced and marketed them further. They even invested in rehabilitation facilities for those addicted to opioids. I also just read an article about how big tobacco companies used the same marketing techniques to market highly-sweetened, artificially-flavored beverages to children. It turns out the two companies that control the largest market share of cigarette sales, also control two of the largest food companies, Kraft and Nabisco. And, as I’ve noted in previous posts, it’s the same situation in the agricultural sector, where the three largest seed companies are owned by chemical companies and dominate more than half the global trade in seeds (check out the following infographics: food companies and seed industry). According to Food and Water Watch, top food and agricultural companies have been spending more than half a billion dollars to lobby congress every year (read the article here). The case of tobacco companies using the same marketing techniques to get children hooked on highly-sweetened beverages is horrifying to me, especially since, according to the Center for Disease Control (CDC), roughly 20% of children ages 2-19 in America are obese, and over 100 million Americans are living with diabetes or pre-diabetes. Of course, it is not a novel idea that companies should market and sell products known to make people sick. I just wonder at what point company executives will begin to prioritize their consumers over their shareholders. 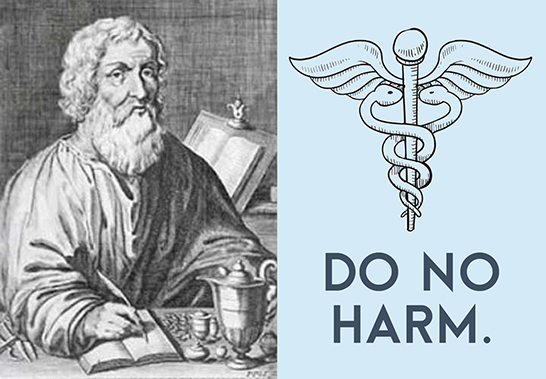 Avoid purchasing products from companies that sell or market things intended to harm the consumers. More specifically, stay away from processed foods, bottled waters and sodas. Support small farmers that produce foods intended to nourish people. Most importantly, demand that legislators enact policies that stop putting the interests of large companies ahead of those of the citizens they represent. 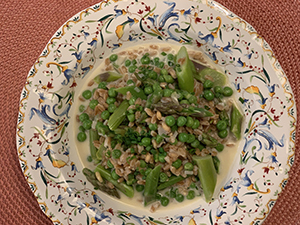 Peas and asparagus are two of my favorite spring vegetables. Accompanied by a salad, this creamy risotto makes a nice, light dinner. 1. Bring a large pot of salted water to a boil. Add the asparagus and cook until just tender, 3-4 minutes. Drain and set aside. 2. In a small pan, bring the stock to a simmer. 3. Melt the butter in a wide pot over medium heat. Add the shallots and sauté until softened, 3 minutes. 4. Stir in the farro and cook until it smells nutty, about 1 minute. 5. Add the white wine and simmer until it is fully absorbed. Add 2 cups of stock and simmer until it is fully absorbed, stirring constantly. Add 2 more cups of stock in 1/2 cup increments, stirring constantly. 6. Add the peas and asparagus and stir well. Add the remaining stock then add the mascarpone and cheese. 7. Season with salt and pepper. Garnish with chives and serve. I’m Rachel Khanna, chef, author, holistic health counselor, wife, and busy mother of four. My passion about food and how it affects your overall well-being has led me to years of study and research—and ultimately to a practical understanding of what it takes to lead a healthy life. This website is dedicated to sharing these insights with you. If you’d like to learn about good nutrition so you can improve your diet and feel your best every day, then you’ve come to the right place. © 2019 LiveEatCookHealthy. All rights reserved.